Ask Leo! #557 – Macrium Free, Large Incrementals, Old Webpages, Charging Phones, and Flash! Macrium Free, Large Incrementals, Old Webpages, Charging Phones, and Flash! In last week's video discussing the feedback I received, and the resulting changes I made to Saved! Backing Up with Macrium Reflect, I promised you a video demonstrating how to use the newly updated free version of Macrium Reflect to make a system image backup. Well, I promised you one, but you're getting two. First: Creating an Image with Macrium Free walks you through the steps of locating, downloading and installing Macrium Reflect free edition, and then shows you how to use it to create a backup image of your computer. Second: Creating an Image with Macrium Reflect Free (Quickly) focuses on just quickly making a backup image of your system drive in something like five or six clicks. It really is that simple - that's why I wanted to show you with this extra video. Have a look, let me know what you think. Also, as I also mentioned last week, just a reminder that if you don't own it already, the price of Saved! Backing Up with Macrium Reflect will be changing in a few weeks when the first edition is discontinued. Your best value will be to purchase that first edition now - you'll automatically get the second edition as well. I thought that incremental backups were supposed to be a lot smaller than what I'm getting. They include only things that have changed since the day before, right? The incremental backups I'm seeing are way, way bigger than just the file or two I updated since yesterday. What gives? The size of incremental backups often surprises people. All you do is edit one small document, and the next day your incremental backup ends up being gigabytes in size – that doesn't make sense, right? But it does make sense, because Windows is a very busy operating system. Continue Reading: Why are my incremental backups so large? How would I get an earlier version of a webpage? For example: I wanted a certain musical selection and I clicked on the bookmarked entrée. Another version of the song came up ' it was nowhere as good as the version that I bookmarked. How would I get that earlier version? Particularly when it comes to media files (like music or video), if a web page changes its contents, whatever was there before is removed from public access. However, there are a couple of things to try. Continue Reading: How do I get an older version of a webpage? I have several USB chargers for my mobile phone. I've noticed that one will charge my phone quickly – like in an hour if it's really dead – while another will take several hours. And connecting a USB cable between my phone and laptop will also charge it, but that seems slowest of all! What gives? Two things are at play here: how much power your charger can supply, and how much power your phone is using while it's being charged. I'll warn you: for the first, at least, you're going to need a magnifying glass, or at least extremely good eyesight. Continue Reading: Why does my phone charge more quickly on some chargers? 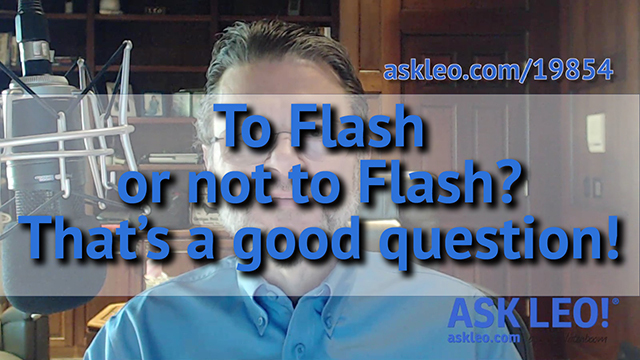 Continue Reading: To Flash or not to Flash? That's a good question! download (v.) is the act of copying data from a remote server to your computer or device. Conceptually, servers on the internet, or in "the cloud", are viewed as being "up there" somewhere. While "up there" is so exceptionally vague as to be meaningless, it does at least imply a difference in altitude: the device in front of you sits, conceptually, lower than remote servers or services on the internet. Thus data is copied "down" from those servers to your machine. Conversely, copying data from your computer or device to an internet server is considered an upload. While I was shopping last week, I came across a former student who wanted to reminisce a bit. We were talking about how often the power has been affected by storms this year, and she reminded me of the "mean trick" that I used to teach them the values of saving often. During the first couple of weeks in my Programming classes, I occasionally turned off the power while the students were writing their programs. (A master switch at the front of the room controlled all of the outlets in the room.) Since the first programs were usually just a few lines, it wasn't terribly traumatic. But they soon learned the value of hitting Ctrl-S frequently. The whole point of this little rant is that there are literally hundreds of thousands of different reasons that things can crash. CTRL+S (or similar) is a way to protect yourself from those thousands of things. In your case, there are thousands of things that could cause what you're seeing, alone. I'd start with malware scans, SFC, updated drivers (video in particular) as a start, and perhaps even a repair-reinstall of Windows itself if things don't get better.